CINCINNATI--Researchers from the University of Cincinnati and private industry are reporting a first in the smart-window market. The patent-pending advance—announced June 10—will lead to windows designed to adapt for brightness, color temperatures (like incandescent light bulbs), and opacity to provide privacy while allowing in light. “[S]hade and privacy can be simultaneously, electronically controlled for the first time,” the team said in a research announcement. Details on the "tunable window films" are published in the journal Applied Optics. The development is simple and affordable to manufacture for residential and commercial windows, the researchers say. It could be used on new or existing windows, by means of a roll-on coating consisting of a honeycomb of electrodes. Most home and commercial windows use mechanical shades to provide privacy and to block light, heat or cold. “This centuries-old technology is already inexpensive and effective, which has slowed the adoption of electronically controlled window tinting,” according to the university. 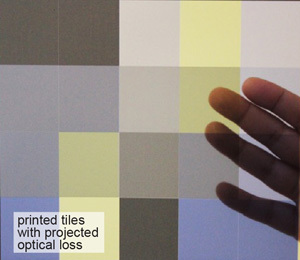 For this project, the researchers were challenged to apply previous innovation involving adaptive optics, e-paper and the use of color in displays on electronic devices to a larger surface, like windows, and to do so in a low-cost way. The technology had to be manufactured for less than $30 per square foot, the industry standard for window manufacturing. 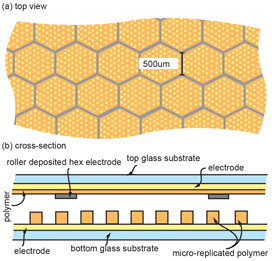 The technology could be used on new or existing windows, by means of a roll-on coating consisting of a honeycomb of electrodes. The image shows top and side views of the device construction. Three years and a $357,526 grant from the National Science Foundation made the breakthrough possible, the team reports. The development allows for windows to turn milky for privacy, but still allow in 90 percent (or more) of the available light, according to the researchers. Moreover, a setting change could dim the entering light or change the color of the light along a spectrum from cooler blue to warmer yellow. “Blinds can’t do that,” said Sayantika Mukherjee, a doctoral student in UC’s Novel Devices Laboratory, part of the university’s College of Engineering and Applied Science. The low-cost window tintings will be able to shade interiors in blue, yellow, black, clear, gray and other colors, according to the team. She led the project with researchers from Hewlett Packard, EMD Performance Materials (a subsidiary of Merck Chemicals Ltd.) and University of Cincinnati professors. This video shows renderings of the windows in action. “Basically, one color has one charge,” Mukherjee explains. “Another color has another charge, and we apply voltage to repel or attract the colors into different positions. The basic technology is not that different from what our group has previously demonstrated before in electronic display devices. “The greater challenge was to find an appropriate device structure in order to apply the technology to the larger surface area of a window in a way that was inexpensive and fairly easy. An estimate of market availability was not available Monday (June 29).